Time to sum up what has happened in the last 24 hours. The Leave campaign proved victorious with a difference of less than 4% across the whole of the UK. However both Scotland and Northern Ireland voted to remain. Scotland’s First Minister has stated categorically that this result means that a second referendum regarding Scotland becoming independent from the UK is highly likely to give voters the opportunity to prevent Scotland being dragged out of the EU against their will. A similar discussion may now also occur in Northern Ireland regarding a potential reunification with the Republic, who are members of the EU. In Wales the majority of the public voted to leave but that has caused a mad scramble from the First Minister to try and secure formal assurances that a financial black hole will not emerge when EU funding is withdrawn, specifically in the deprived areas which need the support the most. The closeness of the result also highlights the huge divide that now exists across the population, with many commentators describing the vote as a rebellion against the establishment. A split has also developed between younger voters, who generally backed remain, and the older generation, who voted to leave despite not having to see the aftershocks in a few decades time. If this split could become nasty, it is nothing to the potentially explosive reaction to immigrants. Whilst politicians are saying the right things that no EU nationals will be booted out of the country, the bitter immigration debates during the campaign have stirred up passionate emotions. A vote to leave and taking control of our borders has therefore made some people from outside the UK feel unwelcome in our country and fearing violent repercussions. This UK referendum has also triggered debates in other EU nations regarding their membership, destabilising the continent at a time of serious threats of terrorism, with countries such as Holland possibly next in line to withdraw. The impact on the UK was instantaneous with the value of the British pound dropping like a stone in the markets, with the FTSE 100 and 250 also falling. Shares in Barclays and RBS banks took a significant tumble as the decision reverberated across the world. The markets had been confident of a remain victory and this reaction addressed the balance from that miscalculation. Scenes of celebration from Leave supporters seem grossly inappropriate in this context. This referendum was promised by David Cameron in the Conservative manifesto to appeal to UKIP voters and appease Euro-skeptics in his own party. However this gamble has cost him the position he coveted the most, Prime Minister. Realistically his position was untenable given his support for the Remain campaign and it is only logical that supporters of Brexit take the lead in negotiating the divorce settlement. Leave campaigners Boris Johnson and Michael Gove are early front runners to take over as Prime Minister but their appointment may trigger another General Election to see if they would have the support of the nation and that could be another tricky vote to predict. The Government’s opposition, the Labour Party, are also questioning the suitability of their leader Jeremy Corbyn with a motion of no confidence being tabled. Corbyn was largely absent from the campaign and unwilling to share a platform with David Cameron because, although both backing the Remain campaign, their reasonings for this position were different. Labour’s failure to get the party’s Remain message out to their traditional strongholds is where a sizeable proportion of blame is being directed and as Leader he is ultimately accountable. As a result both the Government and the opposition could be in need of new Leadership in the next few months. The aftermath of a Leave victory in the early hours of this morning will be felt for months and decades to come, not least as it will take two years for the departure process to be completed. However the impact is being felt right now and I fear we have only seen the start of a Britain now divided and close to tearing itself apart on the streets and in it’s political parties, resulting in a Kingdom no longer United. National Referendums are intended to trigger debate and discussion. However the manner in which the current EU Referendum has been held is utterly shameful. It began innocently enough with both sides making claims which were immediately dismissed by their opponents. A pattern emerged of claim and counterclaim, with neither side really having the evidence to support their viewpoint and both options seeming to be a step into the unknown. As a result statistics began being trotted out to support their spurious claims. One of the major statistics that the leave campaign has jumped upon is that the UK contributes £18.8billion to the EU, or £361million a day “enough for a new NHS hospital every day”. This implies that by not paying in this money the UK could build a new NHS hospital everyday, something I’m sure we would all be happy with. Firstly, that wouldn’t happen. That additional money has not been guaranteed for the NHS but it COULD be spent on it. Secondly, the statistic is wrong. The UK receives a rebate, negotiated by Margret Thatcher, and when you consider the project funding and farming subsidies it in turn receives the net contribution in 2014 was only £8.4billion, NOT £18.8billion. Another major debating topic and source of scaremongering has been the subject of immigration. A leaflet for the Leave campaign this week claimed that Turkey and Macedonia were lining up to join the EU. A handy map was also included to highlight how close they are to Syria and Iraq, countries devastated by conflicts the UK has contributed towards, implying that we will soon be swamped by EU citizens desperate for our resources. Of course, migration has to be controlled and the UK Government’s target of net migration being reduced to 100,000 has been missed. But scaremongering tactics of this nature can lead to some very dangerous attitudes and reactions. Theoretically a leave vote, revoking the free movement of EU workers, could result in a huge loss of those employed in the UK, such as vital nursing staff, and in return pensioners enjoying retirement in Benidorm could have to return to the UK instead; hardly a fair exchange. The Leave campaign state that international law would prevent expats from being forced to return home, the Remain side say there is no guarantee; back to the claim and counterclaims. Workers rights generally will also come under threat. The EU sets minimum standards for working and employment conditions, such as the Working Time Directive which imposes limits on average hours worked, rest periods and paid annual leave. These basic rights for employees are of course a burden on big business who, if free from these requirements, could get away with treating their employees however they saw fit and most importantly of all, saving money and improving profit margins. Nigel Farage, a particularly vocal individual in the referendum debate, tweeted his despair in 2010 that the European Parliament voted for an increase to maternity pay. This is an indication of the potential attitudes that workers may be faced with if their rights are no longer protected, where sickness is a costly inconvenience and shareholders profits come first. Even more terrifyingly the UK could opt out of the European Convention of Human Rights with a Leave vote, and who knows where that might lead. Is the EU perfect? No of course it isn’t. Immigration, the economy, law making and security are all important issues that need addressing but these are ongoing processes and cannot be simply solved with a single national referendum vote. It should also not be made as a reaction to your dislike of PM David Cameron or preference for Boris Johnson. The result of this referendum vote will resound with the UK long after those individuals have left politics. But whatever your reasons for voting Leave or Remain, I would encourage you to fully investigate the facts before making your conclusions. 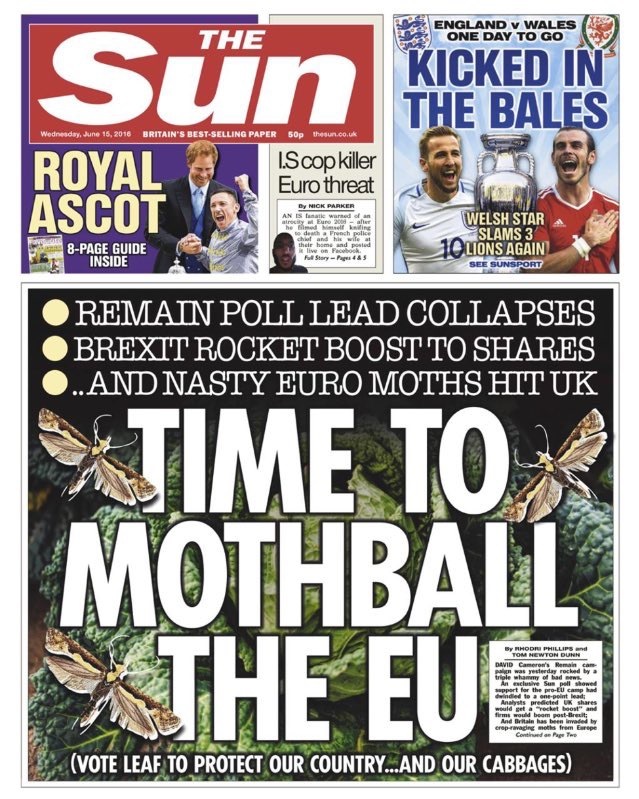 For instance, The Sun newspaper backed a Brexit this week and in keeping with their history of publishing questionable facts, just as Liverpool FC supporters, declared a boost to shares on their front page. 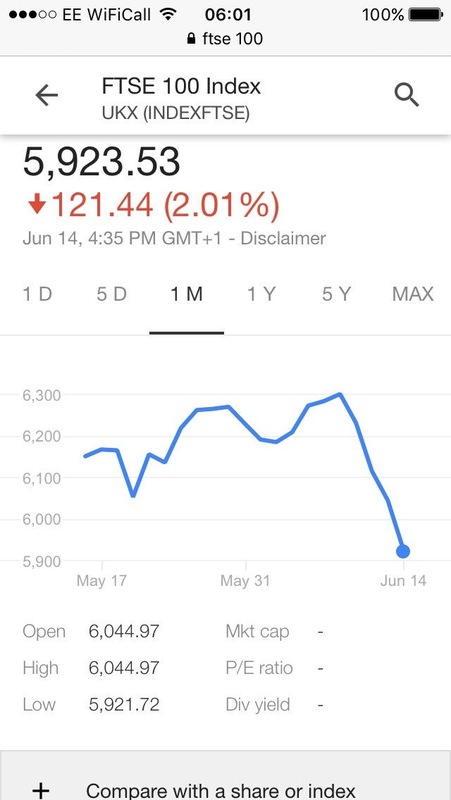 However the reality is that during the recent weeks of campaigning for the referendum the FTSE 100 has developed an undeniable downward trajectory caused by the debate and unknown outcome. Which just goes to prove the need to fully explore the facts behind the headlines and bold statements.